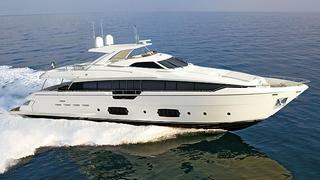 As is now an annual tradition, Ferretti has presented its new 2013 models. Yesterday in Milan the Italian yard revealed details of its new flagship, the Ferretti 960 motor yacht series. Like recent and successful Ferretti motor yacht series, the Ferretti 960 is another collaboration between Studio Zuccon International Project, Advanced Yacht Technology and the Centro Stile Ferretti Group. With a sporty design, the Ferretti 960 is a proud successor to the Ferretti 881, but this time the model is only available in a raised pilothouse version offering large interior volumes. The Ferretti 960 has a length overall of 29.2 metres, but her hull length will be only 23.98m allowing her to be certified to EC standards. Considered as a pleasure boat, she could be driven without a professional captain. The Ferretti 960 has a layout typically seen on larger yachts. She is also the first of the brand to have five large guest cabins. Four equal double cabins are on lower deck, enjoying a beautiful views over the sea thanks to large windows. The master cabin is on the main deck. As with most new yachts, the size of portholes and windows are increased to allow more daylight inside. Crew quarters are forward with three cabins for five members. In its standard version, the Ferretti 960 is powered by twin MTU 16V 2000M84 engines giving a top speed of 27.5 knots and a cruising speed of 24 knots with a range of 340 nautical miles. In another option, twin 16V M93 or M94 engines are available giving a top speed of 29 knots and a cruising speed of 25 knots. A further, more powerful option will be available also to reach a top speed of 31 knots and a cruising speed of 27 knots. The first hull of the Ferretti 960 series will be officially launched in spring 2013.